Tyrone keeper Niall Morgan saved Dean Rock's penalty before Aidan McCrory netted the only goal. 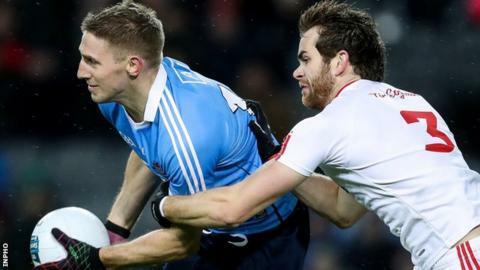 Conor Meyler slotted over Tyrone's other point in the opening 35 minutes while Philly McMahon, Rock and Jonny Cooper were on target for Dublin. Declan McClure increased the gap to four points on the restart before Morgan's superb save from a penalty awarded for Sean Cavanagh's foul on Rock. Mickey Harte's team were now five in front but Bradley was shown a straight red-card four later after clashing with Cooper. Rock made it a one-point game before the forward's composed equalising strike from 53 metres. Mayo defeated Kerry 0-15 to 1-10 in Tralee in Saturday night's other Division One game.